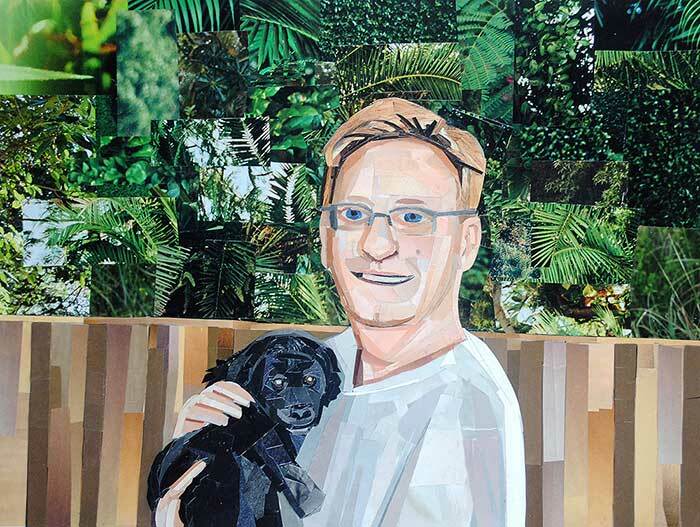 “Mark and Sophie” is a portrait that I was commissioned to make for the wife of a former boss of mine – she wanted to give it to her husband for their anniversary. It’s been a while since I’ve made a portrait collage, so this piece was definitely a bit of a struggle for me. 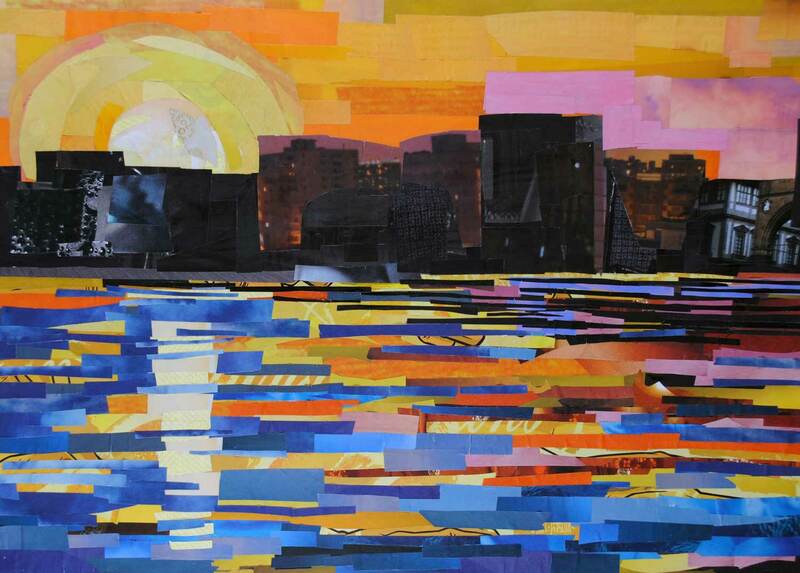 Usually my collages are relatively flat when you look at the surface – I don’t usually use that many layers. However, for this piece, there are definitely sections where I built up the layers more so than others. You can see that it looks a lot different than the final piece. Sometimes my sketches don’t exactly look the way I want the final product to look, but they do give me an idea of how to block out the entire composition. Anyway, although this piece was a struggle, eventually all the pieces fell into place. Just goes to show that if you keep at it with something, eventually you can accomplish your goal. 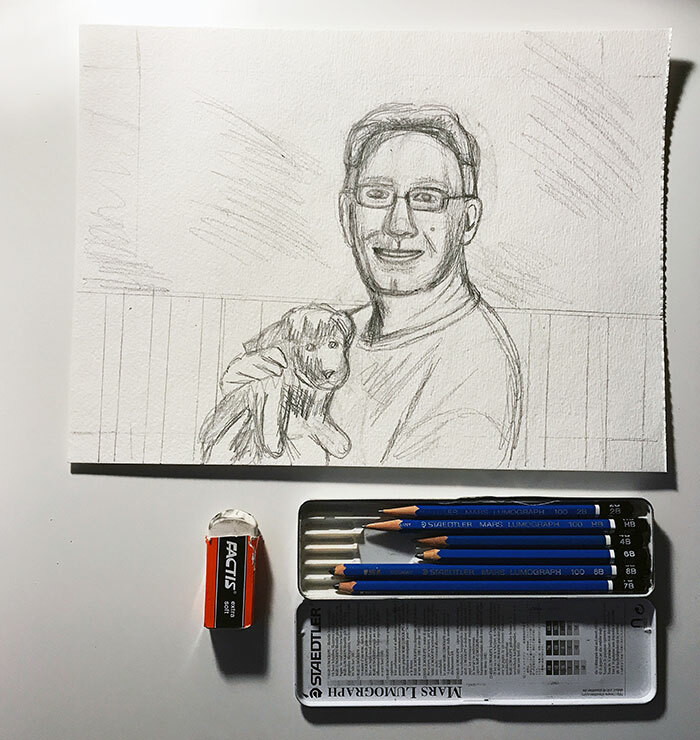 This is a commission that I completed for an author who lives in California. 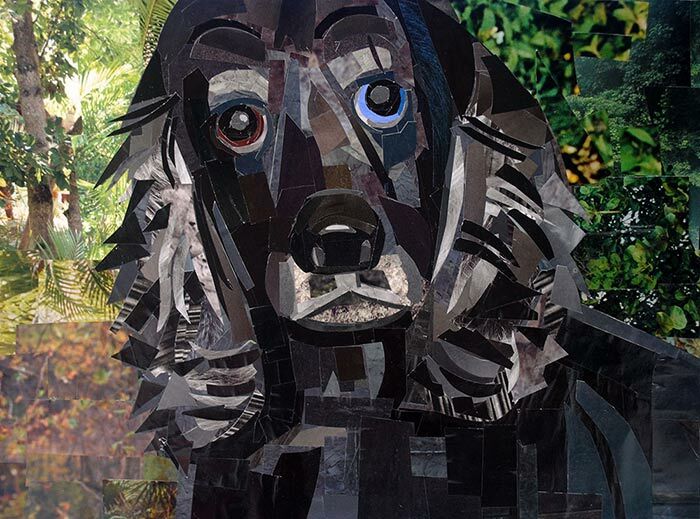 She wrote a story about a collage artist in the DC area, and she thought it was only fitting to hire me to make a collage inspired by a description from the book. 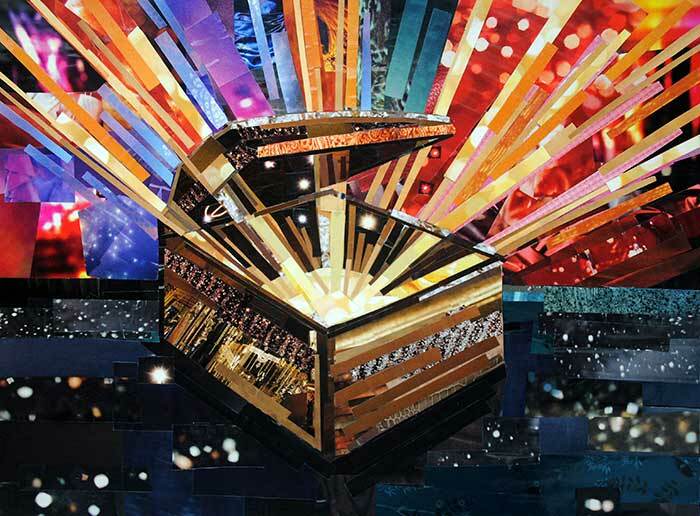 This piece was inspired by a passage that described a work of art created by the fictional artist – a box of memories with light swirling from it. I definitely had a lot of fun creating this piece, especially since it was a little different from what I normally make. 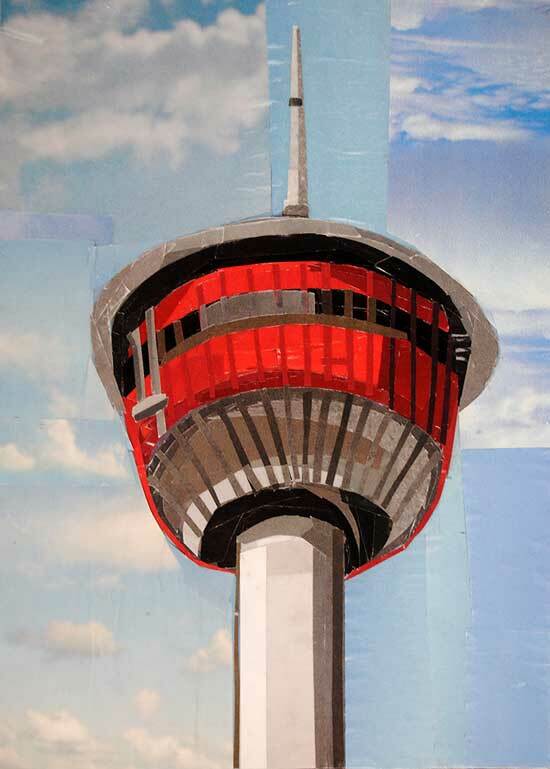 The other day I received a request from a client in Canada to create a collage of the Calgary Tower. Architectural elements are always more difficult when working on a smaller scale, although I enjoyed the challenge. After spending a lot of time focussing on animal pieces, it was also nice to change things up a bit with a building. Last night I completed my first collage in 2015. This piece was commissioned by a teacher from Washington state, who is having her students study my work in class. 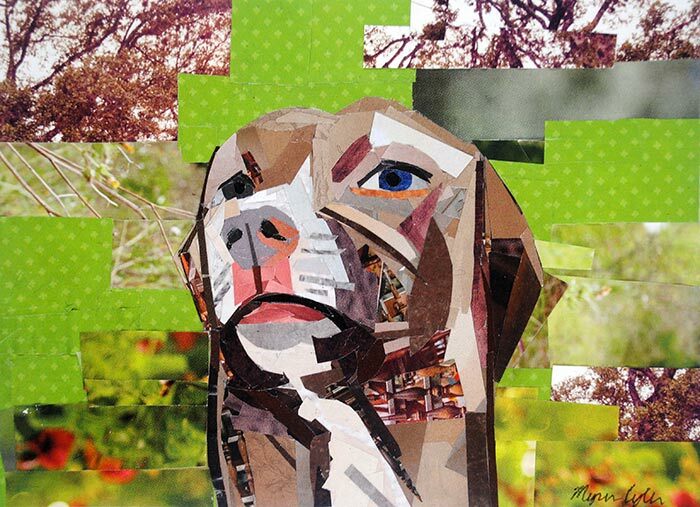 I think it’s absolutely wonderful that she reached out to me to have a work of art made that she can share with her students, so they can see one of my collages in person! 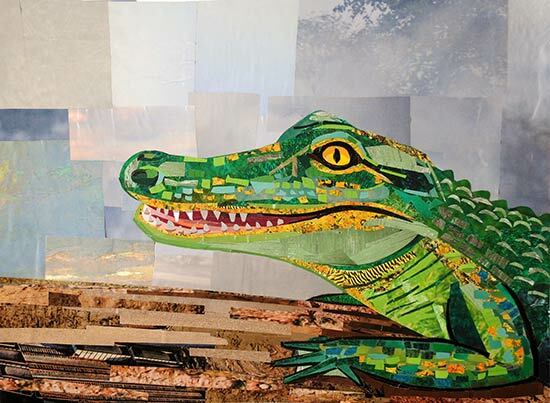 I also had a lot of fun working on this piece – especially with the detailing for the gator’s scales. 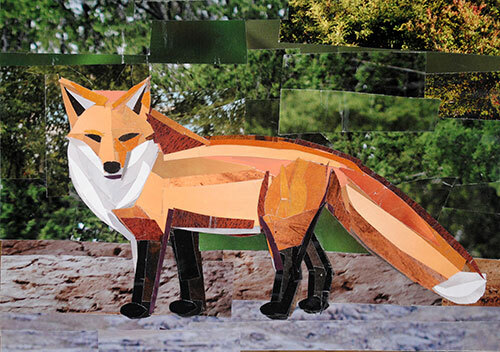 A couple of weeks ago I completed this commissioned collage of a red fox. I definitely had a lot of fun working on this one. I enjoyed working with the color palette and finding bits and pieces of texture to add alongside solid pieces of color. Foxes are such beautiful and colorful creatures. No wonder I liked putting together this collage. I’ve been taking a bit of a break from my art-making so I can unwind and experiment with other media. However, I’m still working away on collages here and there. 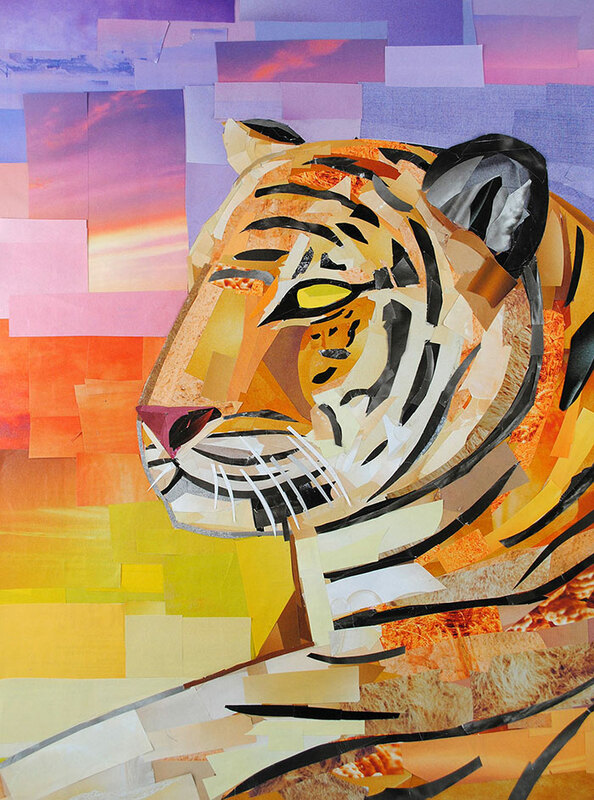 This week I completed my latest commission, a tiger collage. The client had purchased my “Watchful Lion” collage, and was interested in getting a tiger collage to go along with it. She also wanted a sunset in the background of the composition. 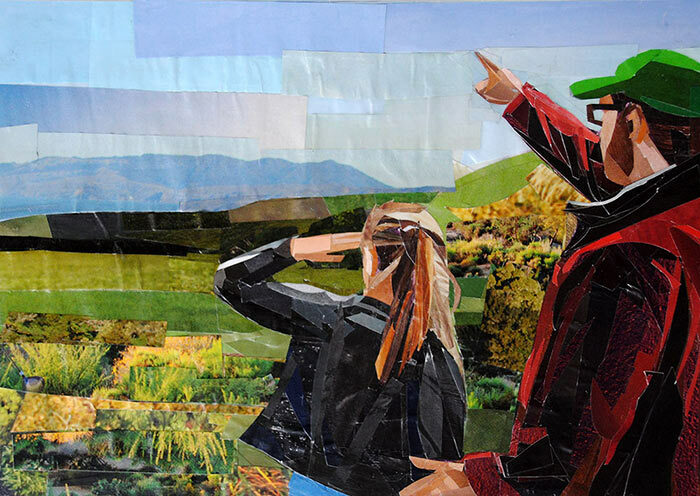 So as I worked on this piece, I kept a thumbnail image of the “Watchful Lion” in front of me so I could make sure the new collage would look related to the previous piece. This one was definitely a fun piece to work on. I really enjoyed using all the bright colors. Here’s a piece I made a couple months ago. It was for a fellow artist and Elon alum. I realized I hadn’t posted this one yet – so here it is! At the moment I’m taking a break with making new collages, but once I get back to work I’ll make sure I post any new pieces. 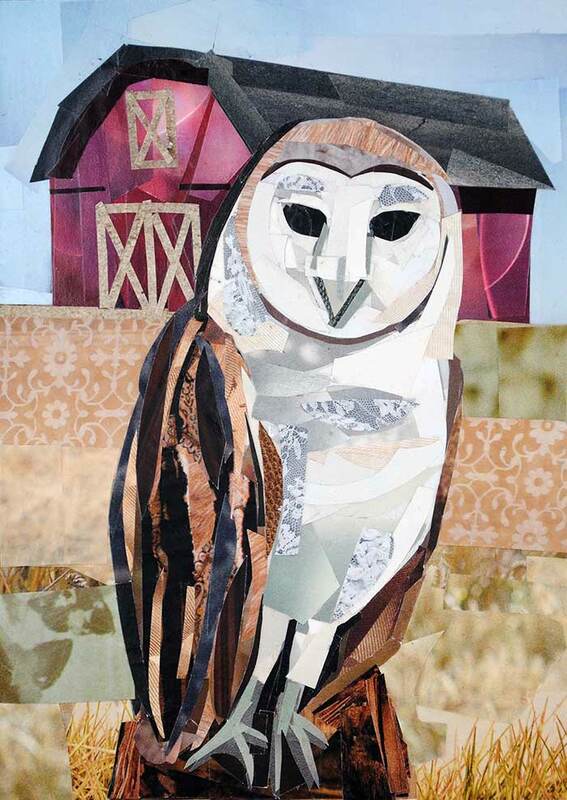 Above is the finished “Barn Owl” collage. The client gave this piece to her sister (who is expecting) to go in the baby’s room. The color scheme I worked with matches the colors used to decorate the room.